Giant Chocolate Chip Cookie Cake….This should come with a warning label. My husband loves sweets. Probably the most enjoyable thing about cooking or baking is doing it for someone else besides the fact that one is learning something new. 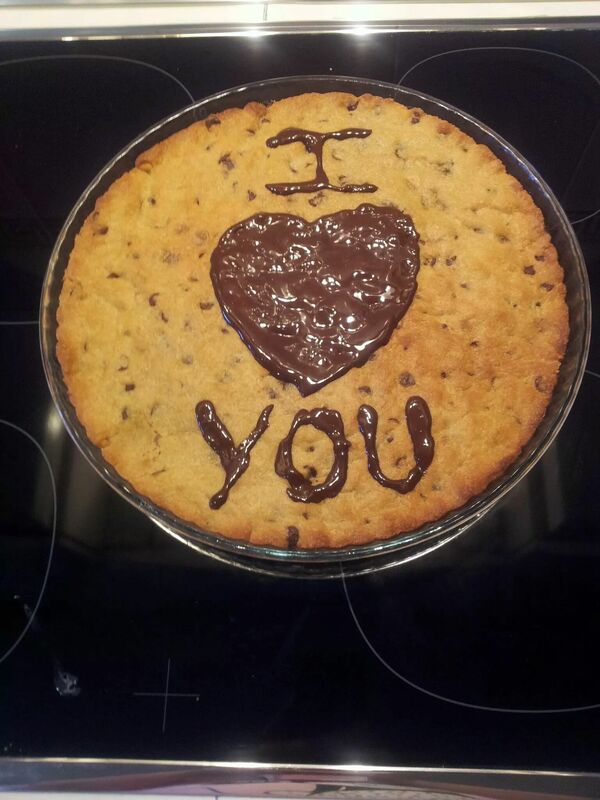 So, for Valentine´s day I made him the cookie cake. It was simple. It was beautiful. It was UNBELIEVABLE. That´s it. Really. The only change I made was that I didn´t use a pizza dish. I used a glass Pyrex pie dish about 2 inches deep and 12 inches wide. I made this for a get together at work and I was asked for the recipe numerous times. Or..if you are really naughty serve it warm with a scoop of vanilla ice cream. ← Homemade Irish Cream…Yep, you read that right.